With the latest innovative features, the Sport Utility Stroller is perfect for any off-road strolling experience. Knobby tires and high-impact polymer composite wheels maximize traction. A fixed front wheel provides increased stability hiking, jogging or when the trail gets rough. Its durable, yet lightweight, easy-fold frame makes it easier to transport the Sport Utility Stroller to wherever your adventures start. Youll know your child is having a smooth ride with a state-of-the-art suspension system, ultra-padded reclining seat and adjustable five-point padded harness. A simple twist of the front wheel tracking adjustment knobs keep you rolling straight. When engaged, the parking brake helps secure a stopped position. Hand Brake provides additional stopping assistance when strolling. Tires: Pneumatic tires. 16" x 2.0" knobby. Tubes: Pneumatic with schrader valve. Hand Brake: Caliper type hand brake on front wheel. Includes: Multi-position independent sun canopies. The BOB Weather Shield is made of PVC coated nylon with clear mylar windows. The seams are high frequency welded, making the weather shield 100% waterproof. Weather Shields are available for both single and double strollers. Help protect your children from the sun, wind and flying insects. The BOB Sun Shields specially designed mesh screen reduces the suns harmful ultraviolet UVA/UVB rays. 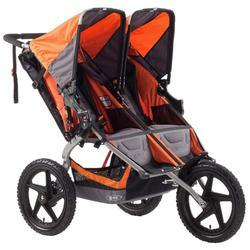 Compatible with all BOB Revolution and Stroller Strides Duallie (two-seat) strollers. The Handlebar Console provides the stroller user with two watterbottle or drink holders along with a zippered storage compartment for keys, cell phones or other small items. Made from a Rip-stop Polyester, and attaching with four velcro straps to any bob single or double strollers. This at your finger tips storage will make strolling and running with your BOB that much more enjoyable. Exploring can really work up your child’s appetite; attach the Snack Tray so he can snack and sip on the go. Easily and securily attaches with the BOB Accessory Adapter. One sippy cup holder and tray carries drinks, snacks or toys.